East Devon, United Kingdom An EOD team was called to investigate three grenades found at the Knowle Hill Recycling Center after an employee reported the suspicious finds. EOD confirmed recovering one live and two spent smoke grenades from the site. Tarkio, Montana EOD from Whiteman Air Force Base traveled to a Atchison County scrap yard to examine a WWII rocket located among scrap metal being sorted for recycling. The munition was mixed in with some farming implements at the plant. Workers on the scene realized the potential danger and alerted authorities. Eversley, United Kingdom Workers at a quarry found a munition at the worksite and called the police to report the find. Police responded and evacuated the area before calling in the bomb squad. 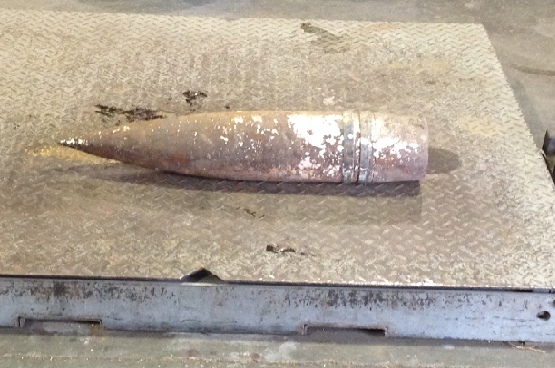 Lakehurst, New Jersey Workers at Sims Metal Management called police after finding a munition item mixed in with scrap metal being recycled. The Emergency Services Unit of the Newark Police Division responded and declared the 1,000 pound munition (specific type not reported) "safe". Newark police subsequently reported the discovery to officials at Joint Base McGuire-Dix-Lakehurst for final disposal of the munition. Find occurred on 22 September 2016. Miri, Borneo An unexploded WWII mortar was detonated after it was found mixed in with scrap metal at a Borneo recycling plant. Police and bomb disposal experts responded to remove the UXO which was identified as a live mortar round. It was transported to a safe location for detonation. 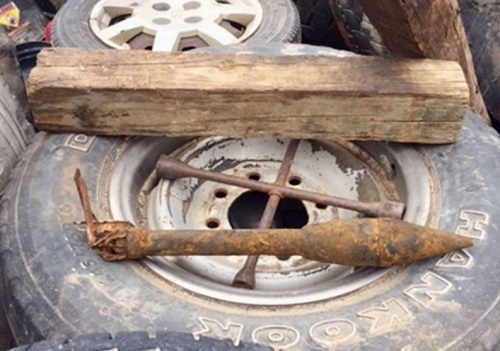 File This UXO Find Under "Here We Go Again"
Frederick, Maryland The Maryland State Bomb squad responded to what has become an all-to-familiar scene of a suspect UXO at a scrap yard. Officials removed what appeared to be an old hand grenade from Reliable Recycling Inc.
An employee noticed the munition in scrap pile. The grenade was intact and appeared to still have the pin in place. The item was moved to a distant part of the yard away from employees and behind a concrete barrier while employees called 911. Tucson, Arizona An investigation by the Arizona Division of Occupational Safety and Health found no misconduct by Tucson Iron & Metal, the scrap yard where a worker died last year after he cut into a MK-82 general purpose bomb, resulting in the deadly explosion. A report issued cleared the company from responsibility in the accidental death of Daniel Wright, 46, who used an acetylene cutting torch to cut into the UXO. According to the report, another employee who recognized the item as ordnance told Wright that they were not to cut into anything that might be an explosive, but Wright believed it was safe because he thought it was hollow. Norton, Kansas Dangerous ordnance finds at scrap metal facilities continues to be a problem across the U.S. At times these military munitions have led to injuries and even death. 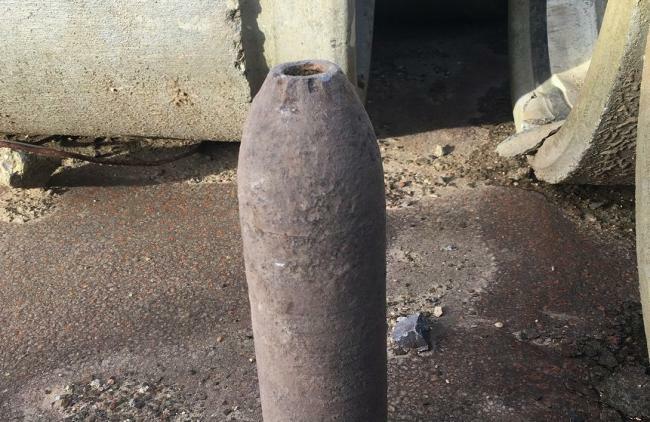 Fortunately the latest incident, a WWII era projectile found in a scrap metal pile at F & F Iron and Metal, was safely recovered by Ft. Riley EOD after workers reported the find to police. EOD safely relocated the munition, shown below, for off-site disposal. Authorities do not know how the item arrived at the facility. Washington, D.C. Senator McCain (R-AZ) submitted a letter to the Secretary of Defense demanding answers following the accidental death of a scrap metal worker in his home state from UXO. The worker, Daniel Wright, 46, died in the explosion where he worked at the Tucson Iron and Metal yard. In the letter, Senator McCain asks for an explanation as to how a 500-pound MK 82 bomb wound up in a scrap yard and requested an explanation of what methods DoD has in place to educate the public about the risks of UXO. Tucson, Arizona A worker at Tucson Iron and Metal was killed when the metal scrap pile he was cutting into exploded. Police were first notified of the accident when a South Tucson police officer was flagged down as he was driving a few blocks from the scrap yard around the time of the explosion. Authorities determined that the man was cutting into military ordnance when the explosion occurred. The man reportedly died instantly and no one else was injured. Officials from nearby Davis-Monthan Air Force Base responded to perform a check of the area. No additional live munition items were found and they reported "no missing ordnance" from their inventory. However, the UXO was likely from a range area which explains why it was not listed as "missing" as once expended / fired, a munition is no longer tracked.